This is a sponsored post written by me on behalf of AeroGarden in conjunction with Kitchen PLAY. All opinions are my own. Living in the midwest, I am a "four seasons" kind of gal. I sweat under the hot summer sun. I welcome the rain and the tender green buds in spring. I slog through the snow and ice in the winter. I rejoice in the cool air and colorful leaves in autumn. And no matter how much I complain that it's too cold, or too hot, or that a certain perfect season isn't long enough, I wouldn't want it any other way. That said, I do miss summer's bounty when it comes to cold weather cooking and entertaining. Especially when the holidays roll around. Sure, I can run to the market and pick up some herbs and veggies that have been either shipped or (preferably) locally grown in a greenhouse. And I do. But isn't it so much easier, and much more satisfying, to walk barefoot to the garden and harvest your own? That would be a yes. Enter the AeroGarden. It's high tech. It's high output. It's an indoor garden. That means that even there's a foot of snow on the ground outside my window, I can still wander barefoot to the garden and harvest my own herbs (or veggies, or even flowers). Less than 30 days ago, I set up my very first AeroGarden, the ULTRA series; it could not have been easier. Once I'd snapped all of the pieces into place, it was simply a matter of plugging it in, adding water and liquid nutrients (included) to the base, and sliding the seed pods into the holes. The instructions were simple, and there was no mess (since the system is hydroponic). I positioned it in an open corner, and hoped for the best. Now, as much fun as watching my seven varieties of basil growing from seeds to hearty plants was, I think that watching my kids help and marvel over the growth of the plants was the best part. The MyGarden Control Panel displays the time, how many days it's been planted, and when to add nutrients. But it also shares tips for helping you get the most out of your garden. Every time a new tip came in, the kids were eager to read and relay it to me. As the plants grew taller, we were able to raise the grow lights. The kids also helped me determine when and where to prune the herbs, making sure that the faster growing ones didn't block block the light from the slower growing ones. They told me why this process was essential. Whether indoors or outdoors, a garden is a great learning/teaching tool! But come on. You know what the ultimate reward was, don't you? 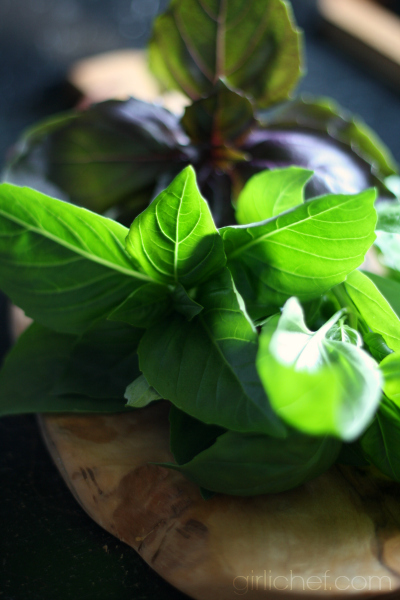 Lush, green (or purple) BASIL IN THE WINTER! Okay, technically it's not winter yet, but once the snow and freezing temperatures move in, that's how I start referring to the season. That little corner of my house is like a summer retreat, heady with the smell of basil lingering in the air. So, long story short, when planning and testing recipes for the holiday season, I walked barefoot to my garden and snipped myself some basil. And it felt amazing. Am I weird? It makes me giddy to grow my own food, no matter how small. Not that I can take much credit; my AeroGarden did all the work. 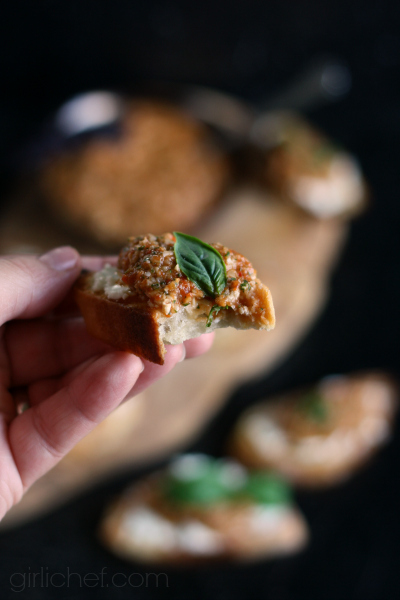 But once I walked barefoot into the kitchen, basil in hand, it was my turn to work. 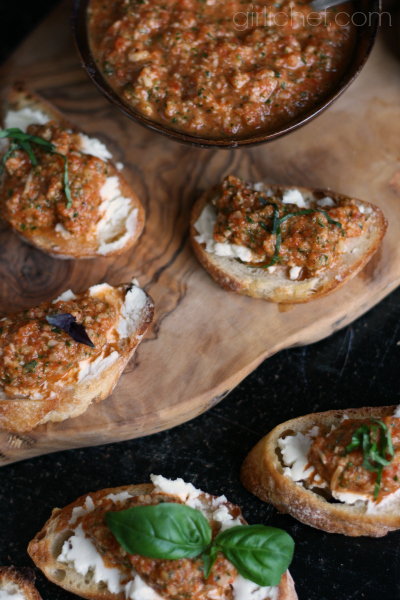 Although these crostini are a simple appetizer to put together, their taste is anything but simple. My basil went into the food processor with some roasted red peppers, almonds, and grated cheese. Olive oil turned them into a silky pesto. Along with a good, crusty baguette and some soft, tangy goat cheese, I had an appetizer that kept people reaching for more. And me, personally? I could snag a whole tray and sit in a corner with it and a bottle of white wine and be perfectly content for an evening. But I would never do that. Never. Roast the red peppers over an open flame, or under a broiler until blackened and blistered all around. Place in a bowl and cover with plastic wrap, allowing them to steam for about 15 minutes. Slide the skin off of the peppers, then pull out the stem and seeds. Cut into quarters. Place the prepared red peppers into the bowl of a food processor, along with the remaining ingredients (except the salt and pepper) for the pesto; pulse until almost smooth. Taste, and adjust seasoning with salt, pepper, and more lemon juice, if needed. Set aside. Preheat the broiler. Cut the baguette into 1/4-inch thick slices, on the bias. You should get approximately 24 slices. This is really going to depend on whether your baguette was longer and thinner, or shorter and wider. Either way, just go with it, as it should all even out. Line up the baguette slices on a foil or parchment lined sheet tray and set under the broiler until they are just kissed with a hint of gold, 1-2 minutes. Turn them over and repeat. Rub both sides of each slice with the cut side of a garlic clove. Turn oven down to 350° F. Divide and smear the goat cheese evenly over one side of each slice, and set them back onto the lined sheet tray. Drizzle with a little bit of olive oil. Slide into oven for 5 minutes, or until goat cheese is warm, and edges are golden. 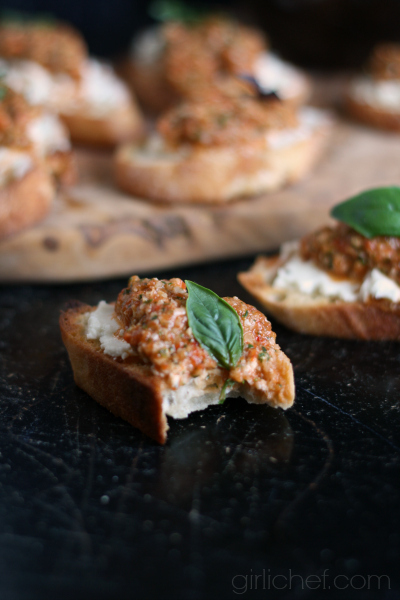 Top each slice with a spoonful of the pesto (how big a spoonful depends on your slice - use your best judgement). Top each one off with a little sprinkling of fresh basil that you have sliced into a chiffonade (thin ribbons), or with a tiny sprig, if you like. 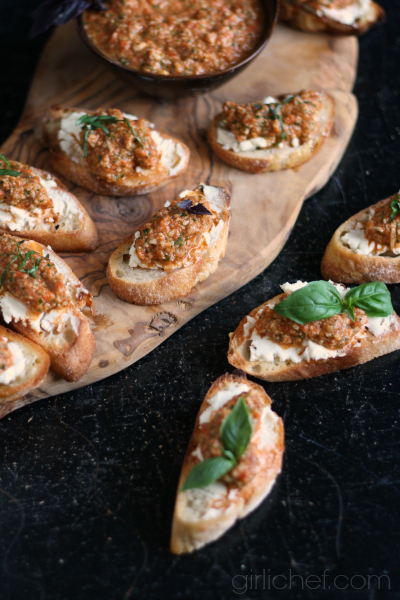 These go well with still or sparkling white wine. 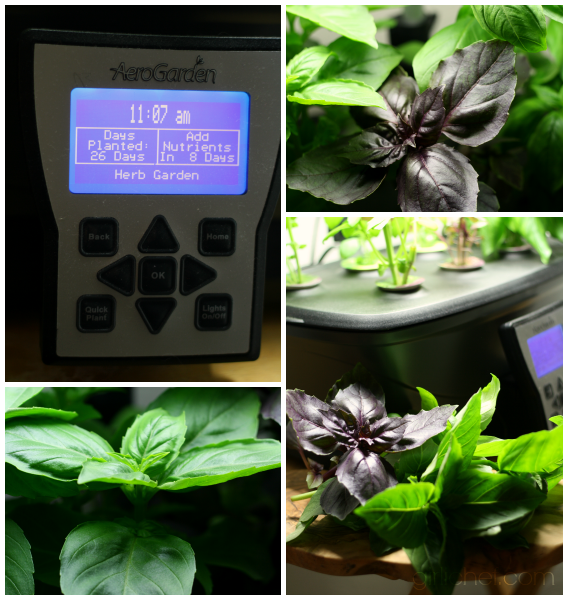 For more fresh holiday entertaining ideas, drop by the Kitchen PLAY page to see how other bloggers fared with their AeroGardens, and to browse their holiday recipe ideas featuring basil. You can also connect with AeroGarden on Facebook, Twitter, and YouTube. AeroGrow will be running its ‘12 Days of Deals’ for the holidays with discounts and special bundles for the season. Plus, get up to 20% on everything storewide when using promo code ‘Holiday20’ in the shopping cart at checkout.